Protests in Iran continued today, as millions came out to rally against the Iranian elections amidst a controversial call to have the presidential ballots recounted. Yesterday’s pro-opposition rally claimed the lives of seven people and injured dozens. Iran’s political unrest has seen protests all around the world as well as in Toronto. Canoe Live sat down with Morteza Abdolalian, an exiled journalist from Iran who is now a member of Journalists in Exile, to tell us how Iranian-Canadians are shedding light on the situation in Iran.In response to the violence, Adolalian says that yesterday’s protest claimed the lives of at least eight people and that many, including journalists and political dissidents were jailed for their support against the election process. He also raised concerns over the filter of information, saying that the government has banned SMS and mobile service in some areas. Although some forms of communication have been restricted, Morteza says that he relies on the internet to find out what is going on in his country. This past weekend Morteza says that Toronto’s Iranian community came out in numbers to condemn the elections with many echoing the phrase, "Where is my vote?" 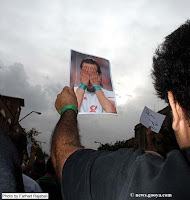 While most protestors were in support of denouncing Iran’s elections, there were a few who were in support of Iran’s current president Mahmoud Ahmadinejad. Ayattolah Taheri in a statement called Ahmadinejad's government as Tyrant and unlawful! "Together with people who'se vote has been stolen ,I call this election as tampered and nullify and the repossesing of the government by the past president is unlawful and tyrant. " Government bann on reformists newspapers made people to decide to write on the walls - A social forum to keep fighting with this coup d,etat regime. The people have started new way of protest by writing their thoughts on the walls of city . The coup d,etat government banned all foreign media or restricted their free reporting and internally the government own most of the print or online media and TV / Radio stations. Writing on the wall is a way of protest. 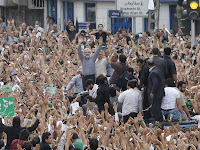 Iranian abroad will join in mass rally if Ahmadinejad comes out of Iran! My computer was down yesterday again. 1-Mohammad Mostafaei the youth juvenile defence lawyer was arrested in front of his young daughter and taken away. The wife of Mr. Mostafaei says: On Thursday together with Mohammad and our young daughter went out , plain cloths security forces reckognized him and arrested him. First they brought him to our home and then to his office , after searching these two location they took him away with them. See , the fundamentalists forces planned a coup d, etat and are now executing. 2- "Guidance Council" approved the elction. "Good bye Islamic Republic " says one article. Ayatollah Janati one of the fundamentalist Islamist and secretary of Guidance Council and a supporter of Ahmadinejad and Khamenei in a letter to Ministry of Interior approved the competency of presidential election. 3-Ahmadinejad is a lier and his Government is illegitimate , and a Government of coup d, etat and Iranian all over the world must stay on alert and protest in mass wherever he goes or been invited by foreign countries if any . Lets boycutt Ahmadinejad ,s Government from today.protest against the Guidance council is still going on, foreign reporters are still banned to report . Report says: Musavi have been arrested!!! while people were at "Ghoba" mosque chanting " death to dictator " , according to news Karubi, Faezeh Hashemi and her mother the wife of Hashemi Rafsanjani and the son of Ayatollah Beheshti were among the protesters in "Ghoba" mosque. Clashes have been reported between the protesters and the riot police forces. One of the news indicated that Musavi the president for change has been arrested. The personal website of " Iranian Satyrist "Ebrahim nabavi" also reported that Musavi is infact been arrested. Another report says : Musavi not arrested, its just rumors. As we did to the Shah of Iran! Today Sunday protest of the president Musavi's supporters in Shariati street around "Ghoba " mosque.- people chant:" Death to dictator"
Mr. Karubi the reformist and change candidate sent a letter to Guidance Council: Nullify this election ! Today Sunday close to 700,000 people have gathered in "Ghaba " mosque and there are so many riot police forces ! There are news that close to 700thousands of people have gathered around the mosque and the street close by the mosque.Many security forces are also in the area.The riot police forces are so many.Mr. Musavi didn't come to the mosque yet. This is where young Iranian women "Neda Agha Soltan" was buried- Neda was just protesting for the violation of her rights! Armen chakmakian made a music piece for "Neda" The young Iranian women killed in recent protest by Islamic Republic regime thugs! I composed a new piece of music for her. This is the demo version that I just finished writing, recording and mixing in my studio a few minutes ago. It's a free download. Please feel free to download it, share it, remix it, etc. Info:In the beginning of the track, you'll hear audio from the video that was aired around the world. WARNING - the video extremely graphic:YouTube VideoAt 1:21 you'll hear a woman yelling at the police (military?) who are beating innocent people walking the sidewalk. She's yelling to them to beat her instead. Audio is from this video:YouTube VideoHer translation from the youtube page:"Hit me. Not hitting me now that Im filming?Come on hit me. Hit me once. Weren't you just hitting me before?How many people have you hit?Hit. Hit him.Yes, yes you must hit them.﻿"
Musavi: The election must be nullified and a new election must take place ! Mr. Musavi has responded to the request of Guidance council . Guidance council asked the reformists candidate to let the two representatives of council to look into the irregularities. Mr. Musavi said; he has concern and protest to the result of this election , he emphasized that the recounting isn't the solution and the only way to gaine the confidence of the people is to start new election. On Saturday June 27 Mr. Musavi rejected the two member board of review by Guardian council to look into the election irregularities. Mr. Musavi said ; the members of the board must be impartial while the guardian council itself is biased and partial . Reformists trying to get permit for a protest rally in "Azady " square in Tehran! the chief coordinator of the reform council Mr. Abbas Mirza Abutalebi is trying to get a permit for a peaceful protest in " Azadi " Square in Tehran and Mr. Musavi will carry speech in that rally . The date is not yet announced. Based on the article 27 of the constitution people are guaranteed to have peaceful gathering . On Monday,longest human chain protest to election rigging in Tehran-Iran ! On the coming Monday there is going to be a long human chain in Iran from " Rah-Ahan ' square to " Tajrish " square. 1-The Gidance Council proposed on two representative to review the complaints of candidates about the election disputes.But the spoksperson for Karubi and " Etemad Melli " newspaper Mr. Esmail gerami Moghadam said : "Two of the people that Guidance Council asked to look into the irregularities of election must be changed , because they are openionated and partial while the board of review should be impartial." 2-Musavi:The fair way to get out of this situation is to nullify the election and call for a new election. Tomorrow Sunday people will join Mr. Musavi in "Ghaba" mosque. The despute is that the "guidance council" is a biased board, including ( Ayatollah Yazdi , Momen , Elham and Janati). In the letter Mr. Musavi has put the competency of Guidance Council into question and demanded ; "in order to get out of crisis , a national arbitration board must be established". d-Activities after the voting and the announcement of the result . The activities after the pol was closed and the announcement of the result of voting is in a way that; it opens no other door than to call for nullification of the elction and call for a brand new election. Musavi: I won't stop fighting for the rights of people! Upto now Musavi has released eight statement to Iranian people. All of them talks about his continuoues fight and not bending to the pressures of the regime. Ahmad Khatami a fundamentalist cleric in todays prayer demanded for the execution of Musavi and Karubi the two presidential candidates with reformist and change agendas. Today people in Iran and all over the world in memory of the martyrs released green baloon to the sky and stood in silence. The grand son of Khomeini Mr. Hassan Khomeini who also support the change and refom called the people to gather in his grandfathers shrine in outskirt of Tehran. A new way to fight back, Slogan on Iranian money: "Where is my vote", " Death to dictator"
Mohammad Mostafaei a human rights defender and a lawyer of more than 100 teenagers ( juvenile offenders)who received death sentence in Iran is among those arrested. the regime must release all the political prisoners immediately. If not , the protesters in mass rally in the future date , may move toward the prisons and open the door on prisoners, i'm telling this because the regime knows that was what happened 30 years ago at the time of Shah's regime. what regime is doing is inhuman and must be stopped immediately. For years, women's defiance in Iran came in carefully planned flashes of hair under their head scarves, brightly painted fingernails and trendy clothing that could be glimpsed under bulky coats and cloaks. In a part of the Muslim world where women are often repressed, these images have catapulted Iran's female demonstrators to the forefront of the country's opposition movement. It is a role, say Iranian women and experts, that few seem willing to give up, and one that will likely present President Mahmoud Ahmadinejad's hardline government with even greater challenges in the wake of the recent violence and protests. "Iranian women are very powerful and they want their freedom," said one woman in Tehran who said she's been taking part in the protests. Like all women in Iran interviewed for this story, she did not want to be named, fearing government retribution. "They're really, really repressed, and they need to talk about it." What this regime is doing is pouring oil on the fire and making the Iranian people more angry! Danger , Lives of thoes who have been arrested in the recent protests are in great danger. More than 5,000 Iranian have been arrested , among them many prominent reformist politicians and personalities, journalists and human rights advocates are also included. The political prisoners are under torture and forced confession . UN human rights council must send a representative to Iran immediately to stop the killings. The NGO's must put pressure on their Government to call the Iranian ambassador for questioning and demand to stop the torture and killing of prisoners. 2- the situation in Iran is dramatically changing and the human lost in this situation is immenent. This is all because of regime cheating the election on June 12 and then on June 13 announcing Ahmadinejad as the winner of presidential election. As a result people were shocked to hear this and to accept this , so , they poured into the street on June 13 by hundereds of thousands and sometimes by the millions ,this become the news of the day through out the world day after day . Its now 14 days since june 12. 3- who was behind this? Definitely not Ahmadinejad alone, he is just a pupet , the mastermind behind all this was Khamenei the leader of the Islamic Republic himself and his sons.Because of this Khamenei lost credebility among many clergies and Ayattolahs who support the reform, and even those who were in between. Khamenei made a big mistake and lost his credebility as mediator between the fundamentalist clergies and reformists, him by deciding to stop and reversing the course of reform by supporting Ahmadinejad the first time and by cheating and rigging the election in the second time around made the people and reformists angry, therefore a sharp division among clergies and Ayatollas has developed. The people in the protest chant " death to dictator " now. 4- The protest will continue and if the major unions such as National Oil workers , Government Employees union , teachers union , nurses and transit workers and .... will join the protesters and call for strike , not only the illegitimate regime of Ahmadinejad but the Islamic Republic as a regime will be vanished from Iran . It seems to me that the regime does not understand this and still playing game and pouring oil on the fire by making the people of Iran particularly the young people who are making 70% of the population angry. So, the solution is simple. The regime must accept the cheating in the election and call a brand new election.That simple, or face the consequences. Iranian Ambassador to Mexico, The killing of "Neda" is the work of CIA!? Viva Iranian young women and men fighting for freedom and their human rights ! Is it time to retreat? on what price? This last 12 days of peaceful protest by Iranian people inside and outside Iran is a step forward and never it would be called as a step backward. It brought new political stage, developement and dimensions. It cleared so many things in the mind of Iranian people as well as the political personalities. Khamenei is definitely lost his role and become a "dictator" not only to the eyes of millions of Iranian people but also on the eyes of many clergies and ayatollahsand international stage. The participation of many clergies in the recent protests is the proof fore that.People now know who really are behind this agenda. They will continue to know and recognize these people and must carefully display them on the stage as big as Iran and inform people about them and their agenda.In the coming days and months people will continue to resist and fight back . People did also learned the tactics of regime in fighting them. so, protest may continue on a different ways and will bring a nation wide strike with it. Ahmadinjad's Government may fall half way through. 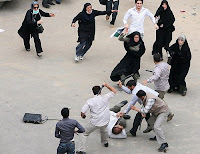 Look at the Basiji's from the rooftop -shooting at people and in response the people throw rock at them! The slogan : " Death to dictator" ! Iranian people fight back- This is Tehran , the capital of Iran, all over Tehran is in blood,fire and smoke!This is the 12th day of protest! At this crucial moment my computer is too slow! Brave Iranian women resist and fight back for their rights and freedom! Many many people have come from Baharestan Square to "Sepah" square (Eshrat Abad ), Hillicoopters are flying over the " Baharestan " square. In order to prevent the busy situation , the security forces closed down the doors to all passage to the buildings and the people are trapped inside . A young man is wounded and others carry his wounded body and scream "Alah ho Akbar"
Up to this moment a 19 years old girle have been shot to death! Who are killing our young childrens? Clergies among people in recent protest against Khamenei-Ahmadinejad's election cheating! Karubi: Ahmadinejad's Islam is Taleban style of Islam! Mr. Karubi in an open letter to Mr. Zarghami the head and representative of Khamenei in " Seda Va Sima " Government owned TV and Radio stations: Those countries that are supporting Ahmadinejad's Government are propagating the petrification Islam and Taleban style of Islam. 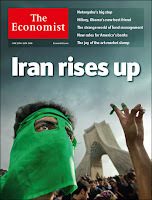 Islamic Republic in Iran in deep international and political crisis! France, Sweden, Finland,Netherland, Denmark, Germany, Britain , Belgium and Canada. Iran has expelled two British diplomats - Britain in reaction did the same. Iran has called the ambassadors of Britain, Switzerland and Czech Republic. 700 employees of Ministry of Energy already started their strike in Tehran! Through a friend -member of the board of a company i was told that today 700 employees of Ministry of Energy are on strike. Will the call for major strike become possible in Iran for tomorrow and next day? Karubi : Tomorrow we will gather in five Tehran Squares! Tomorrow we will gather in five Tehran squares! A peaceful gathering against election cheating ( Rigged election) , for the freedom of all arrested and political activists and in memory of all who have been killed in the violence displayed by the Government militia's. Not to be afraid is the best answer to the violent displayed by the ruling body ! Shirin Ebadi: Boycutt the Government in Iran! Shirin Ebadi the Iranian Noble Prize Winner and president of "Centre for Human Rights Defenders" in Brusseles in a conference together with Mr. Abdolkarim Lahiji : The world governments must politically boycutt the government in Iran. Behind all the arrests of journalists Iranian or foreigns and behind all the ban on internet /blog and websites including newspapers is one man Judge Said Mortazavi the suspect in the murdering of Zahra Kazemi the Canadian-Iranian photojournalist who orders against the national interst. Several plain cloths security forces attacked on " Kalameh Sabz" newspaper managed by Mr. Musavi the presidential candidate for change, all its editorials and editors have been arrested and the newspaper office is closed. According to news report the number of journalists arrested in a single attack on newspaper is 25 journalists. This journalists were there to get their salaries , said Mr. Alireza Beheshti . Behind all this arrests and ban is Said Mortazavi -"This Man ". The butcher of independent-reformist media and the arch enemy of bloggers and independent journalists . Regime has fears from the coming demonstration on Wednesday and Thursday! the government offices are not allowing people to take off from work.The regime asked the managements not to let people to take off on the next two days. Abdollah Momeni the spoksperson for " Advare Tahkim Vahdat " an student organization and an organizer of the Karubi's ( one of reformist presidential candidate ) headquarter. Iran Watch Canada full time volunteering to bring the voice of voiceless people of Iran , now that the regime shut down all foreign media! Call for protest by Musavi and Karubi on Wednesday and Thursday in Tehran! This demonstration will be held in fornt of the Islamic Republic legislative Assembly ( parliament ) in Baharestan square. Mr. Musavi together with his wife Zahra Rahnavard will join the demonstration . the statment says; this will be a peacefull demonstration against the result of election..The demonstration will take place at 4:00pm and Mr. Musavi will speak at 5:00pm. People of Iran rise up and join us! the communique also asked people to continue chanting on their rooftop from 6:00pm - 8:00pm every night. Public strike in all over Kurdistan province have started! Strike was called by Kurdistan human rights organization and writer Association, political personalities and political partys also joined the protest. In his first public address to thenation since demonstrations erupted in many cities across Iran, SupremeLeader Ayatollah Ali Khamenei today blamed foreign media, calling it "evil"for attempting to divide the people of Iran. Iranian authorities continueto crack down on journalists in an attempt to control information asdemonstrations continue to grip the country following last Friday'sdisputed presidential elections, the Committee to Protect Journalists saidtoday. ALERT - IRAN 22 June 2009 Various newspapers banned and censored SOURCE: Committee to Protect Journalists Iran censors newspapers amid unrest (CPJ/IFEX) - New York, June 18, 2009 - With street demonstrationscontinuing in Tehran, Iranian authorities expanded censorship, banning thepublication of two newspapers. The Committee to Protect Journalists calledon the authorities to lift the bans and to allow international reporters toreturn to the country. One of the close range plain cloth shooter in the street in Tehran. He is owner of a metal factory. Iranian-Canadian protest today Sunday in solidarity with Iranian people ! Join the protest , let your voice heard, lets support Iranian people ! SPECIAL THANKS TO TORONTO POLICE AND QUEEN’S PARK FOR THEIR HELP. Disturbing image-The young girl killed yesterday- Khamenei-Ahmadinejad end the violent now! Let the people of Iran express their thoughts! Dear Mori;There were 2 points about the way they shoot protesters in the past days, 1 - they are all shot in upper body i.e. heart, neck or face which means they are shooting to kill 2- many of them are shot by basij sharp-shooters or snipers from the roof-tops or windows or balconies of building facing street.these buildings either need to be monitored or demonstrations need to be in open spaces like parks or big fields.Also the use of buses to protect protesters is an idea which several people have mentioned.Please publicize these issues on Balatarin as I am not a user. thanks and let's never forget the look on the face of Neda, in her last minutes of life. 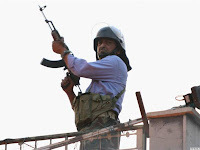 CNN report indicate that; according to hospital report in Saturday's protest 19 people have been killed. Unconfirmed report were taking about 150 people killed instead. There are news that; people are asking the Government employees and Bazar shop owners to join the people and close their stores.
. She said ; the Guardian council to nullify the election and start new election. She also said; The Goverment is responsible for the safety of the people. Guardian council decided to count only10 per cent of the vote which was rejected by Musavi and Karubi.Karubi and Musavi are for new election. There are talks that if the government employees and workers join the protest and start their strike, and if the oil workers also start their strike , this would becom a way of civil right way of protest to defeat the regime. suggested instead washing it with soap and water use lemon and vinegar. Jila Baniyaghub and her husband Bahman Amoei both journalist and strong advocate of human rights have been arrested . Jila recently won an international award. Mass arrest of reformist and journalists and political opposition has been reported. The Air Force officers who played vital role during the revolution in Iran has called theBasiji's and revolutionary guardsand other police forces to stop killing people or else the Air Force officers officers will help or join the people. The people of Amir Abad resisting in front of militias and they entrenched behind garbage dumpers .Amir Abad street is the front line resistance in Tehran. 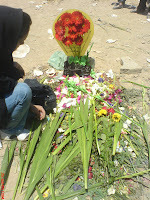 Reports: Tomorrow we will put flowers where the young girl "Neda" was killed . Report: By nation wide protest we will bring this regime to its knees. 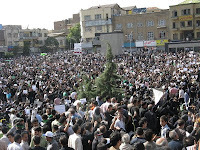 In Rasht, Tabriz, Isfahan and Shiraz cities there are clashes between people and the special guards. People have attacked to a Basij headquarter in Navab blvd and set it on fire. Reported Fereshteh Ghazi a reporter. Mojtaba Khamenei son of Ayatollah Khamenei is one of the master mind of electoral coup d'etat and he is the chief architect of the mafia of Ansar Hezbullah , he is also very powerful among the ayatollah,s in the city of Qom . Reports indicat that he is now 40 years old and in 10 years from now could become a possible successor of his father. this is perhaps the blue print of all this happening in Iran . Khamenei's son is also one of the powerful man backing Ahmadinejd . Mr. Khamenei ! people will put you in the place where you belong. In all over Tehran and big or small citys gathering and clashes have been reported. There is a report that the boming of Khomeini's shrine is the work of Ministry of Information. 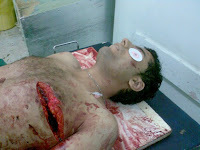 some of the people have been shot by Basiji's from close range. Musavi told he has prepared for martyrdom and went to the rally and was speaking to the gathering in Jaihun street. There is an unconfirmed news from European CN news that from top of a building shows a lot of people are lying on the ground wounded or shot. Karubi,Musavi and Khatami are going to be in Revolution Square. Ghuchani the editor in chief of the Karubi newspaper "Etemad Melli ) has been arrested at his home last night. "Entekhab" website has been shut down . Right now there are clashes between people and " special guards' in Azadi street. There are gunshot in the air and tear gas and ... and the people are throwing stone and chanting "death to dictator" . The clashes this time would be more bloody and may be more people will be killed. Karbaschi the political advisor to Karubi one of candidate has asked the people to protest and he said he is going to attend the protest. The Government control " Seda va Sima " TV and Radio channels instead of Karubi , Musavi and Khatami headquarter announced ,there wont be protest today and the protest has been cancelled. 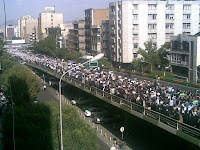 Despite of rumors the peoples are in the streets in Tehran. The Coup d'etat government is trying to tell to people that the protest for today has been cancelled. Safaei Farahani a pro reform member of "Mosharekat partey" has been arrested . The media owned by Government of Coup d'etat is forging and fabricating letter from personalities . They have announced that the office of Hashemi Rafsanjani is going to release a statement about election while the office of Rafsanjani denied the report. If we are together no army can defeat us. Karubi to guardian council : nullify the election and accept the people will . Iranian people joined the protests are not "Dirt"!!!!! Karubi the reformist presidential candidate in a letter to "Gurdian Council" asked them to nuliffy the past election result and call for a new election. This letter is extremely important because it suggest different approach to supreme leader of the Islamic Republic Khamenei who beleive the election was genuine and he congradulated Ahmadinejad. Karubi in his letter defended the people of Iran who have protested in the street for the past 6 days. He attacked Ahmadinejad calling the people as " dirt with wood chip". Another report indicate that; the people are going to bring with them their will ( They might die)while joining the largest protest tomorrow in Tehran. In this protest more clergies will participate , one particular group is called " Jamiat Rohanion Mobarez" The Association of combatant clergies. Every Iranian youth are a reporter, said one report. Now that the coup d'etat government restricted foreign media to report from the streets in Iran , this phenomena is vital to let the world know what is going on in Iran. Mr. Musavi and Karubi two of the disputed presidential candidate asked the poeple not to go to the friday prayer headed by Khamenei and instead they are planning a large protest on Saturday. Khamenei approved the election result and said Ahmadinejad's openion is closer to his and he thretened the election disputed leaders Mr. Musavi and Karubi not to break the law. Iranian people knew this was coming and from now they know how to continue their protest.They are taking things in their hands. There is a sharp division among Islamic Republic officials including dispute between Rafsanjani and Khamenei who supported Ahmadinejad. For Ahmadinejad speaking on corruption charges against Rafsanjani and his childeren. Yesterday Rafsanjani's daughter attended the protest and spoke to the gathering. In the past Rafsanjani's wife also asked people to get out into streets and protest. Most important news is that, large number of reformist politician and journalist have been arrested and are under intense interrogation, adding to this is ; many pro-reform Ayatollahs are under house arrest. 85% of vote in the embassy in Canada went for Mr. Musavi . Reform movement in Iran is more stronger than Khamenei and Ahmadinejad thought! Islamic Republic is in political turmoil in all over Iran. United States of America is making another big historical mistake by ignoring Iranian people's outcry that their vote has been stolen by Ahmadinejad's garrison Government in this presidential election. European countries displayed more sympathy with Iranian people and their outcry for their vote has been stolen. Ahmadinejad is a hard line Islamist, he has the support of Ali khamenei and other "Taleban" clergies.After election Coup d'etat , now they are planning a massive attack on Iranian protesters. Iranian youth must take everything in their hands and continue their protest and support for Musavi and Karubi and reform. They have the support of many clergies and grand ayatollahs and the coming days are very crucial in their fight back and resistance for reform ,freedom and human rights. 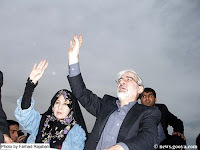 More than one million people joined the protest today in Tehran.Musavi & wife joined the protest,Karubi the other candidate also joined the protest. Canada -Ontario Governments reaction to faudulant election in Iran! "The Ontario government is deeply concerned over allegations of voter fraud in the recent presidential elections in Iran. Ontario fully acknowledges, echoes and supports the Government of Canada's call for a full investigation into these electoral discrepancies. We urge the federal government to continue closely monitoring the situation in Iran. Ontario believes that open and transparent elections are the foundation of a strong democracy and that the will of the Iranian people should be reflected in free, fair and authentic elections. Today, we join with the Iranian Canadian community in urging Iran to respect the rights of their citizens. It's my hope that the situation will come to a just and peaceful resolution." Thousands of people gathered in the city of Shiraz to protest the fraudulant election by Ahmadinejad and in support of Musavi and reform! Three of the victims of the recent protest. 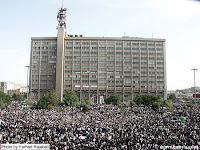 The protest against fraudulant election in Iran is growing bigger and bigger and brings more citys into the protest! IRAN WATCH CANADA on December of this year has reported that this year Iran will face more strike. Millions of Iranian people have gathered in the 3rd consecutive day of protest against the fraudulant election. Iranian people have protested today with black dress in memory of thoes who have lost their lives in recent protest. The protest extended from "Topkhaneh" square to Revolution squre. Mr. Karubi and Musavi two of the presidential candidate have joined the protest. 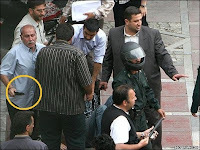 "Basiji" militia one of several anti-reform Ahmadinejad forces with motorcycle tried to disrupt and attack on people. Because of security reason Statoil has closed its office in Tehran and it is possible the Statoil remove its 120 employees out of Iran. Amnesty International must release another statement and indicate the correct number of people killed in Iran! It is not 5 people for sure!!! Right now, people by the thousands have gathered in "Topkhaneh /Imam Khomeini " Square and they are dressed black. Today's rall will be huge because it is about the martyrs of recent protests. Upto now one reports indicate there are 9 and another report says 30 people killed and 95 wounded. Although it is hard to find out how many exactly killed in all over Iran . Or it is also hard to find out how many have been arrested. one particular group must look into this issue. The worst comment Obama made on Iran! Recently Mr. Obama the president of America told to reporters thet there is no difference between Ahmadinejad and Musavi!!???? Is there really difference between Obama and George Bush ? I mean really? Obama can't make judgement on the difference between Mir Hossain Musavi or Khatami and Ahmadinejad? Sometimes you want to doubt what you hear or read and you wan a wash your eyes and read the sentence again or to listen and listen more !!??? Unbelievable! Why do you say that? Aftermath of basij(Government Militia)attack on Tehran University dorm in which 5 students -2 wom & 3men killed and many wounded. (Toronto, June 17, 2009) Canadian Journalists for Free Expression (CJFE) is extremely concerned with the recent media restrictions imposed by the Iranian authorities following disputed election results. According to results announced June 13, Mahmoud Ahmadinejad was re-elected as president. The results have been challenged by defeated opposition candidate, Mir-Hossein Mousavi, and many of his supporters have taken to the streets in protest. Although censorship of pro-Mousavi media began before the election, restrictions on coverage of protests against the government have increased dramatically since the disputed results were released. At least 10 Iranian journalists and bloggers are thought to have been detained and two female journalists have been physically attacked. Among those arrested yesterday were editor Mohammad Atrianfar and blogger Mohammad Ali Abtahi. Today two more journalists were arrested, Abdolreza Tajik and Saeed Leylaz. Various newspapers and television stations have been shut down or censored by security services. And, satellite television, mobile phone and SMS messaging networks have been jammed. The internet has played an important role in helping spread information but it is being monitored and controlled by Iranian authorities. Social networking sites such as Twitter and Facebook have been blocked in recent days; however, some Iranians are still able to access and post important information on these sites. Foreign media are also affected by the crackdown with journalists from media organizations such as the BBC receiving warnings from the Ministry of Culture and Islamic Guidance to remain indoors and refrain from covering protests; if they do cover protests, the Ministry claims that their safety cannot be guaranteed. CJFE is dismayed by the restrictions and attacks on media coverage which mean that once again the citizens of Iran are denied their basic right to free expression and access to information. Foreign Government should not recognize Ahmadinejad Government. They should do qiet opposit and have solidarity with people of Iran.Latest video. Solidarity with Iranian people much appreciated. Help Iranian people now! Believ it , It's a green revolution. This is the city of Isfahan joining the protest! There were also unconfirmed reports that Mohammad Asgari, who was responsible for the security of the IT network in Iran's interior ministry, was killed yesterday in a suspicious car accident in Tehran. Asgari had reportedly leaked evidence that the elections were rigged to alter the votes from the provinces. Asgari was said to have leaked information that showed Mousavi had won almost 19m votes, and should therefore be president. Cry my country cry loud to be heard -For the record- A young peaceful protester is dying and people cry and can't help him. This is the person shooting at people from the roof top of a building during the protest of millions of Iranian two days ago. Doctors and nurses of Rasul Akram hospital stage protest against the killing - A hospital Doc./Nurse: 28 wounded and 8 dead only in this hospital. Iranian national soccer team playing with South Korea went green. The national team played with South Korea in Korea having green ribbon in their wrist . The first half time went with green ribbon a signe of reform and pro - Musavi, the reformist presidential candidate. The 2nd half went without the ribbon because Ahmadinejad garrison government forced them to take it off. Get out for a massive protest tomorrow! Disturbing pictures are coming from Iran. There is going to be huge rally tomorrow all over Iran at 4:00pm Iran time. unfortunately the videos from youtube are unavailable now but IRAN WATCH CANADA will find and save those video's later and will post it in IWC. Millions of Iranian in protest against the vote cheaters and liers! Happened today- Musavi among millions of Iranian protesting against election result in Iran. More than 4000 Iranians gathered in Mel Lastman Square in Toronto on Sunday to protest against election result and in solidarity with people in Iran!